Just to let you know that I am going away on holiday for 2 weeks from tomorrow so if anyone purchases templates from my Website I won't be able to send them out to you until I return home on 11th September. It will be the kittens first visit to the Cattery so am feeling a little apprehensive about that and we know that we shall miss them but needs must. I have managed to find time to do a freebie card for you before I go so I hope you like it. I wouldn't recommend using heavy card to cut this as it is quite intricate. I used 220 gsm card and it cut fine. 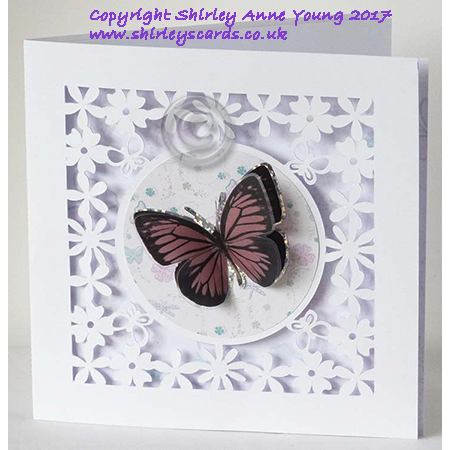 The butterfly is one I found in my stash and is made from acetate - I think it looks quite pretty. Please leave a comment if you download the file. Thanks for the gorgeous freebie. Hope you have a wonderful holiday. Enjoy your time off Shirley. And thanks for the cute card. I love butterflies too. Thank you, your work is amazing. Love the butterflies and flowers -- two of my favorite things. Enjoy your vacation. Thanks for sharing!! A Beautiful design Shirley, thank you. I hope you enjoy your holiday and relax lots. Hi Shirley. Many thanks for this gorgeous card. I hope you have a wonderful holiday. Smiles. Jan. Thank you for this very pretty card. Hope you have a good holiday! Love your cards, so pretty! Thanks for them. Thank you Shirley for another beautiful card. Have a wonderful holiday. Thanks so much for this wonderful card file. Hope you have a wonderful time of rest and relaxation. Thank you so much for sharing your SVG files. Another lovely file. Many thanks. Have a great holiday. Thank you for yet another fabulous freebie and for sharing your amazing talents. Gorgeous file, thank you so much. Hope you have a wonderful and relaxing holiday. Buenas vacaciones que disfrute mucho y gracias por la tarjeta que es preciosa. Thank you so much, this is just amazing. I relly love your freebies. Thank you so much for this beautiful cut file! Thank you Shirley - its my first time on your blog and I am very grateful!!! thank you for the beautiful design! I hope this lets me comment, my computer is so sporadic there are times my comments don't show up. Thank you for the wonderful design. Shirley thanks you for sharing you designs. They are just great. I have downloaded a few, but haven't used any yet. Wonderful card. Thank you very much. I am looking forward to using my colour bursts with this. Thank you. Thank you for sharing. I look forward to making this.